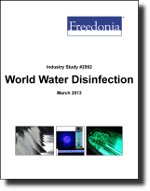 World demand for water disinfection products will rise 5.5 percent annually to $7.7 billion in 2016. China and the Asia/Pacific and Africa/Mideast regions will be the fastest growing markets. A shift in the product mix from elemental chlorine towards higher value chemicals and advanced technologies will continue. The study also considers market environment factors, details industry structure, evaluates company market share and profiles 40 industry participants such as Lonza, OxyChem, and PPG industrie.